United States Gold Bullion Coins are modern US gold coins such as American Eagle Gold Coins, American Gold Buffalo Coins and First Spouse Gold Coins. United States Gold Bullion Coins were introduced for investment purposes and most carry little numismatic value. They get their value almost completely from the gold they contain, usually trading for just a little over spot gold price. The amount over spot gold price covers making and distributing the coins. American Eagle Gold Coins were authorized by the Bullion Coin Act of 1985, and were first produced by the United States Mint in 1986. The Saint-Gaudens design, which first appeared on the double eagle gold piece in 1907, was chosen once again for the obverse or front of these beautiful American Eagle Gold Coins. The reverse depicts a nest of American Eagles which symbolizes unity and family tradition. American Eagle Gold Coins are produced in four denominations including the one ounce ($50), one-half ounce ($25), one-quarter ounce ($10), and one-tenth ounce ($5) sizes. American Gold Eagles are produced from gold mined in the United States and each contains the stated amount of pure gold plus a small amount of alloy to make them harder so that they resist scratching. 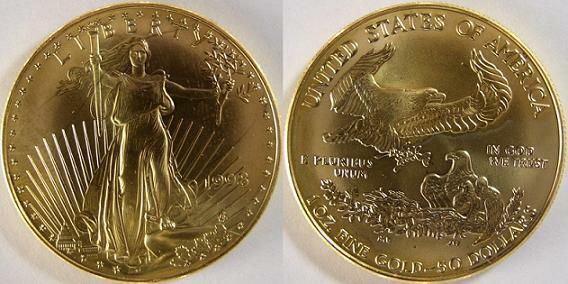 Collectors can find proof and uncirculated versions of American Eagle Gold Coins at the United States Mint Website. American Gold Buffalo Bullion Coins are the first 24-karat gold bullion coins offered by the United States Mint. They are one ounce gold US coins made of pure .9999 fine gold. These $50 gold buffalo coins were authorized in December 2005 by Public Law 109-145 which is also known as the Presidential $1 Coin Act. They were first produced in 2006, with each coin containing its full, stated weight of pure gold. They were modeled after the Indian Head, or Buffalo, nickel which was originally introduced in 1913. The gold for American Gold Buffalo Coins must come from mines in America by law. They are produced at the United States Mint at West Point, New York but do not have a mint mark. If you are interested in purchasing American Gold Buffalo Bullion Coins, you can find them at many coin and precious metals dealers, brokerage houses and participating banks. To find an authorized dealer, check the United States Mint Website here. A proof version of the Gold Buffalo Coin is also produced by the United States Mint especially for collectors. They can be purchased directly from the United States Mint. 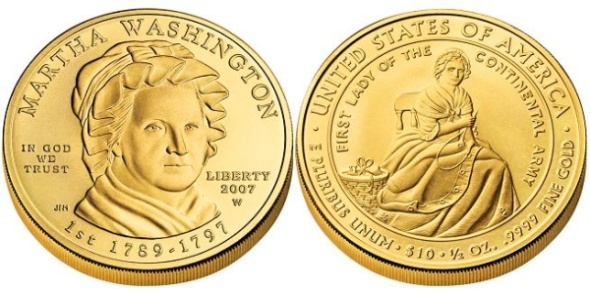 The First Spouse Gold Coins are one-half ounce $10 U.S. gold bullion coins that feature images of the United States' first spouses. They are being released by the United States Mint on the same schedule as the Presidential $1 Coins which honor United States Presidents. The reverse of each coin is unique and depicts an image "emblematic of that spouse's life and work". In cases where a President was not married at the time of his presidency, such as with Andrew Jackson and Martin Van Buren, the image on the obverse or front of the coin is an "image emblematic of Liberty as depicted on a circulating coin of that era". The image on the reverse is in keeping with a theme of that President's life. If you are interested in collecting the First Spouse Gold Coins, but can't afford the high price of gold, The United States Mint also produces bronze medal duplicates of the coins. United States Gold Bullion Coins are very popular with investors due to the fact that their weight, content and purity are backed by the United States Government. They are also eligible for inclusion in U.S. Individual Retirement Accounts (IRAs), making them a desirable asset.